Before Katie's grandmother appeared in their lives, Katie didn't even know that she was still alive. And now that she has, Katie doesn't understand why her mother is so eager to get rid of the woman. For Katie, her grandmother is a key to a past that she knows nothing about and she races to find out as much as she can before the old woman's senility steals away all of her memories. For Katie's mom, losing memories would be a blessing -- she's been living in denial of her past and resents the way her own mother's arrival has stirred the pot. But Katie is obsessed with figuring out what drove her mother and grandmother apart. And as she explores that secret and forbidden past, she is forced to confront issues in her present as well. 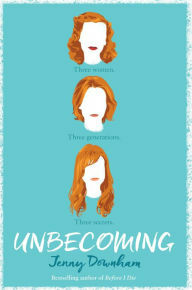 A complicated multi-layered tale of three generations of women with a lot of emotional baggage and dysfunctional behavior. I found the mother particularly unpleasant; her bitterness hard to sympathize with. Downham tries to redeem her in the end, but I found the transformation unconvincing. It also took a while to get into the story as a whole. Some pruning of the various peripheral subplots might have helped tighten the focus. In all, it's an interesting concept and tale, but not presented in a compelling fashion.